A bit of a different post today, I thought as all the advent calendars are coming out I’d do a bit of a post on them. Also yesterday I got something in the post that I’ll probably be posting about as I open them so thought I’d do a bit of a post about that too. The advent calendar I went with eleven purely because I meant to do ten but then added one which isn’t really beauty because I might be getting it. A couple of the companies are bringing out more than one but I’ll stick with eleven in the title anyway. These images I found for some of the advent calendars are definitely spoilers so if you don’t want to be spoiled then I’d stop reading at the end of the advent bit. Though they are just the images used to sell the products in most of them so if you were to buy them online you’d see the same pictures. I personally like to see what I’m getting so like these spoilers but I know others don’t so a bit of a warning. 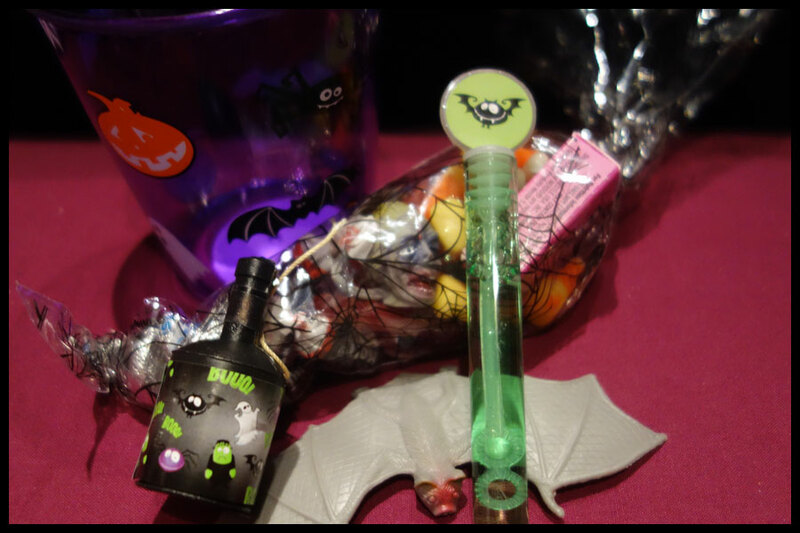 A while ago, I want to say a month but I’m not sure, it was possible to buy a countdown to Halloween box from Enchanted, a bit like an advent calendar but for a week. It arrived and I immediately did that thing where you feel the presents to work out what’s in there and I think I have an idea of what some of the product types will be, I’ll probably post my guess before I open them in the posts I do for them, see if that’s something that’ll be fun for the actual advent calendars I get. Number 28, the big one in purple, is really intriguing me as it’s heavy and big and it feels like there’s a possibility it’s maybe ceramic because of the weight but I could be wrong. Each of the presents has a date on it so for each of those dates leading up to Halloween I’ll do a post for each of the parcels as well as the normal posts for that day because, although they’re going to kind of review the product type, I’m not sure if they’re actual products that can be bought and some might not be from Enchanted as there have been hints for that. 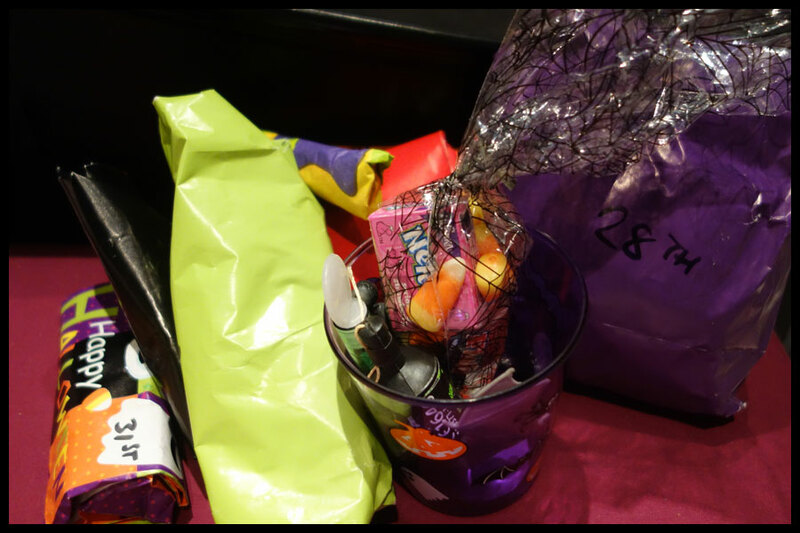 I have already started on the sweets, the Swedish Fish are so nice, and the little plastic bits in the packaging are going to be used as decorations in my room. I’ll probably pop the party popper and use the bubbles, see if my dog likes to play with them as our old dog used to love chasing bubbles but he’s never had the chance. Now onto the advent calendars and there are just so many. I’m not sure if advent calendars are something that’s done around the world or what countries have it as a tradition, it’s just something that we’ve always had growing up, though they were always chocolate not anything expensive but these are so much fun to open each day. There are much more comprehensive lists out there but I thought I’d do the ones that I had found that are, kind of, to a budget rather than the £200 ones. These are all ones that tempted me and some of them are ones I haven’t seen on lists so I thought I’d do a small post for them. Sorry if any of the images are an odd size, I found them all on their own sites or official images and wanted to keep them as large as possible when you clicked on them, some of them have quite a bit of white around but my Photoshop has frozen on me and I wanted to post this today. Don’t you hate it when computers don’t do what you want them to? I was very tempted by the Makeup Revolution one which costs £45 at the moment, £50 when it’s full price as there’s an offer in Superdrug. I thought I’d end up getting this but having seen the products inside I don’t think that the products inside are worth much more than that and there are others which are much more tempting to me. There are single eyeshadows, nail varnishes, face products and lip products though there aren’t any concealers or foundations which is a good move considering how much it would limit people buying it. The final product on Christmas Eve is a palette, I think it’s one that’s available in their online store but it’s not a well known one, or rather not one that stood out to me or one of them that has been called a dupe. There’s also a bigger chest style one with drawers which has palettes and things in which would be more likely to be one I’d get if it didn’t cost £85 (£100 full price). One of the ones I am probably going to get is the No7 one from Boots, it has a range of their products from body washes and skin care as well as makeup like lip and face products, mascaras (at least one full size), nail varnishes and an eyelash curler. This costs £38 when it appears online, on the 28th of October. There is a waiting list you can join but I think that’s to be notified rather than to actually get a calendar. I’ll add a link when it appears online. The Marks and Spencer’s advent calendar is one I haven’t seen much on, it’s going to be available in stores and online in November though I can’t find an exact date. I’ve been interested in some of their beauty products as I’ve heard good things about them and their calendar includes some of their own products alongside other brands like Burt’s Bees, Ren, Rtuals and Stila which are ones I like or wanted to try. This costs £25 when you spend £25 on beauty products, which really won’t be hard. This is the one that I really want, I will be trying to get it but I’m not sure how long it will remain in stock as it’s not one I’ve seen on many lists, maybe a couple, so I don’t know how popular it will be. I’ll add this link too if it’s up long enough to get one. 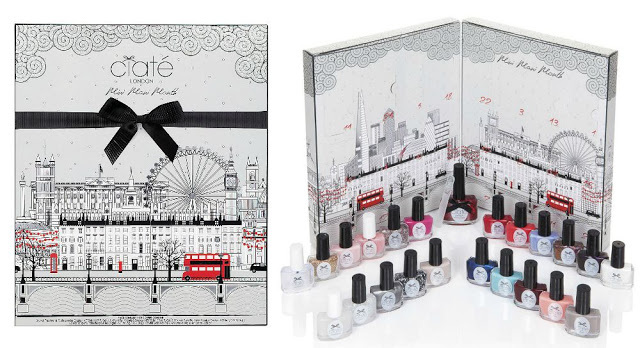 Ciate Mini Mani Month, not technically an advent calendar with its name but it really is. This has tempted me and I’ve bought on in the past and love their products. This is purely nail varnishes and it looks like it has a nice range of nail varnishes, some nail treatments, finishes such as glitters and caviar and a crystal nail file. They’re all minis except the final one though these minis are a good size anyway and mine are from the year before last and still going. This costs £49 and is available in a few places, Asos and Boots have it already, John Lewis often have it too so it’s worth searching to see who stocks it for the best price. This year I think that all of the different stores have the same calendar which is different to previous years. 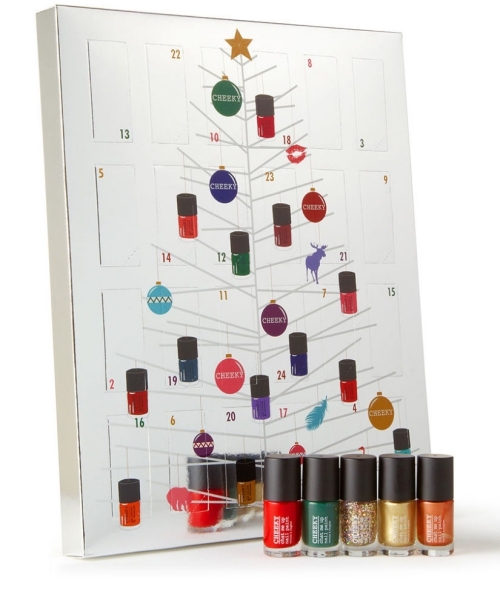 The Cheeky nail advent calendar is tempting me more, I think the range of colours in this one is better than those in the Ciate calendar this time. There are brighter colours and I think they’re all nail varnishes and they’re all colours apart from one top coat and there’s a really nice coppery colour in there which is something I don’t have in my nail varnish collection. This costs £49 in their online store, I’m sure I saw it somewhere else too but I can’t find it now. 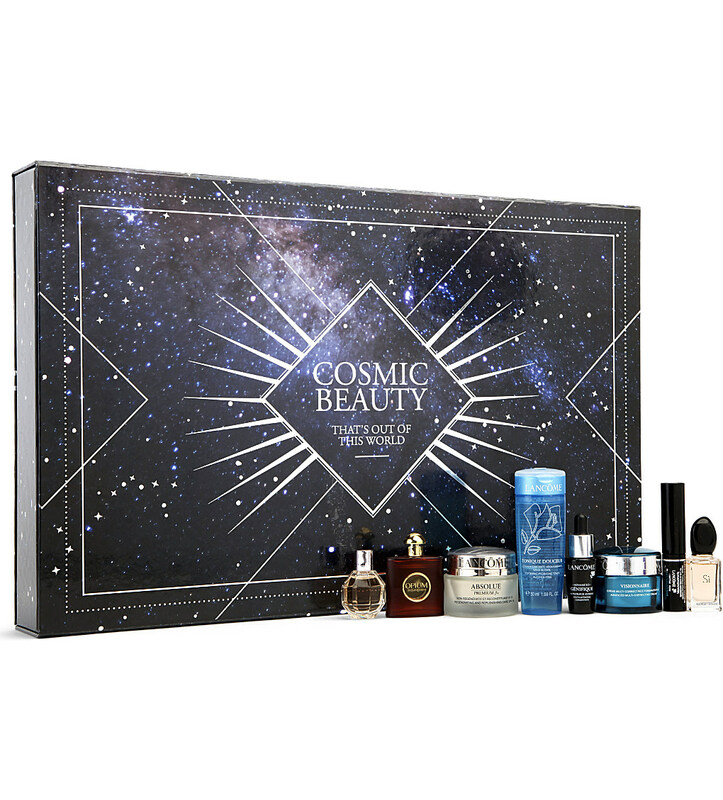 The Bomb Cosmetics advent calendar is one I haven’t seen in many lists, it doesn’t seem to be getting the best reviews on Amazon due to the packaging and the fact that the box with the doors isn’t the best quality but it might be a good one for a budget as it’s £19.99 and it’s all bath things, either soaps or bath fizzers with the majority being the fizzers. I was considering this but I’m not sure the packaging is good enough and I’ve got enough bath products to last me ages. In the past I’ve bought things from Bomb Cosmetics and I do like their products so as far as the product quality goes I’d expect it to be fairly good but the scents can get a bit samey. I think The Body Shop have done these for a couple of years now, they were one of the first I became aware of though it may have only been last year as before then I was all about the chocolate or nails. 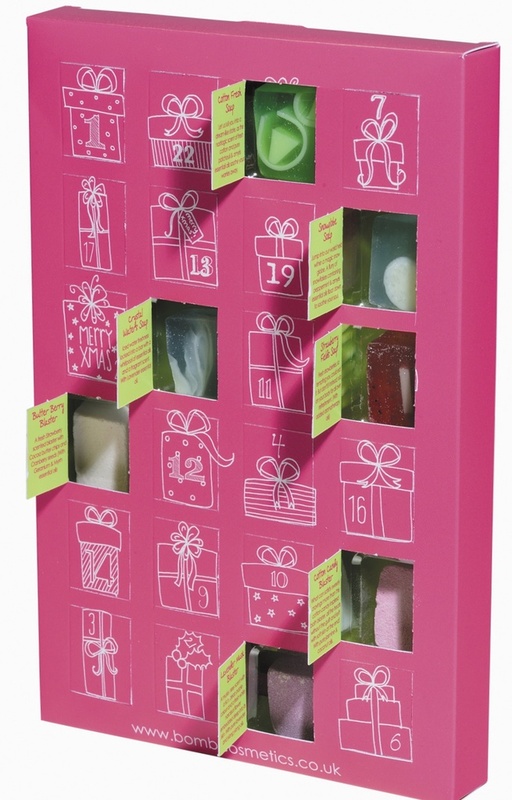 There were two different Body Shop advent calendars originally, one which cost more than the other but now the only one I can find on their site is the £60 version which I think was the cheaper of the two. There’s a nice range of products in there, with some bath and body bits as well as some makeup and a makeup brush thrown in too. The amount of makeup in this one is less than a lot of the others so if that’s what your looking for then choose something else. I do like Body Shop products and might be buying some of their Christmas bits anyway, this could be a good way to try a range of their things for less than they cost individually as it claims to be worth £93.50. You Beauty have done another advent calendar like last year. I only just found it today when I was searching for the links for others and haven’t seen it on any lists but I know last years was good. This costs £59.95 and claims to have £330 of products in there it has free postage for members but it’s only £4.95 if you aren’t so anyone can buy it. It has a big range of products in there, from face and skin care to makeup and accessories as well as some slightly unusual products for a beauty calendar as I can see scent sticks which I think are like the reed diffusers you get for your room. Look Fantastic have an advent calendar out, though unfortunately they haven’t really said what’s inside it aside from saying that it’s worth £250 which does put me off getting it. It costs £70 so, for me anyway, I’d like to have a bit of a hint at what I’ll be getting. If anyone knows any more on this one I’d be interested to see what’s inside even though it is slightly outside my budget. Selfridges is another that’s more expensive at £95 but looking at the brands inside you can see why with YSL and Lancome being two that I recognise. This seems to have a pretty good range of products though there’s a couple of perfume samples in there I think, very good sizes for samples though. There’s a few skin care products and I’m not sure on the amount of makeup in there as I haven’t seen a proper spoiler list yet. 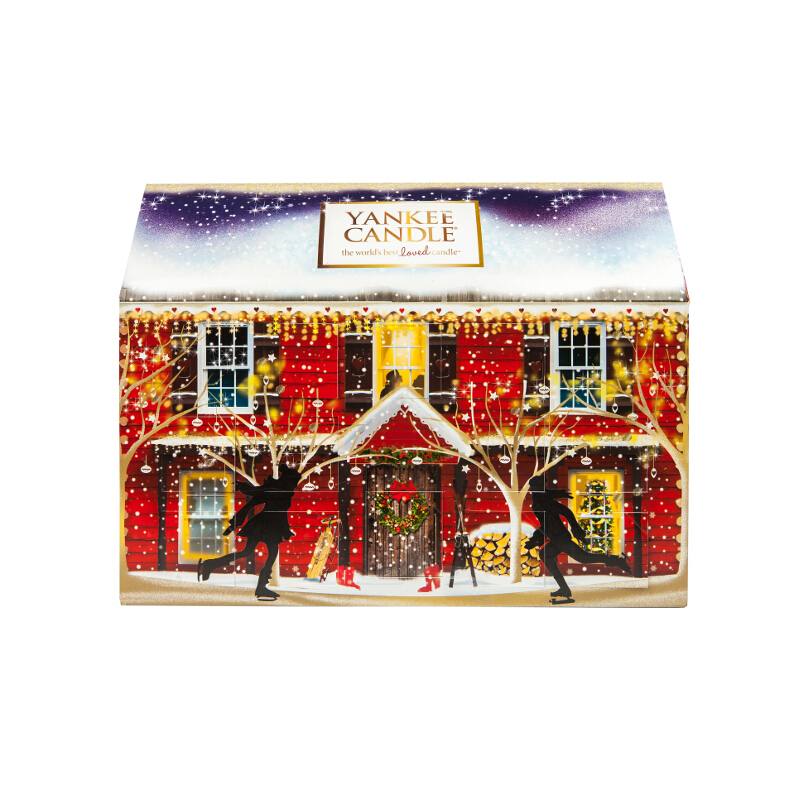 Yankee Candle isn’t a beauty advent calendar but it is one that I always think I’ll get each year, I haven’t bought one yet but I am definitely considering it as I almost have enough Boots points to get the cheapest one for nothing. They come in a range of sizes and the cheapest comes with mainly tea lights and one of the votive candles, whereas the carousel one this year is more votives than the other one has. I think there are three different versions this year, the cheapest is the snowglobe design for £20. These are sold in a range of places including small shops that stock Yankee so it’s probably best to look around for these. There are some I haven’t put on this list because they’re well known or they aren’t ones that I have really looked into. The Benefit one is definitely one that always sells out fast and I’m not sure if it hasn’t already been released and sold out as I can’t find it anywhere. There are a few others I found on the Superdrug store with makeup products in but I have no idea what the brand is like so can’t really recommend one, there’s one which has fluffy animals on it, by Flutter for £8, which looks like it’d be a good one for teenage girls or those just getting into makeup as it’s the sort of cheaper makeup products like Technic used to be when I was younger. 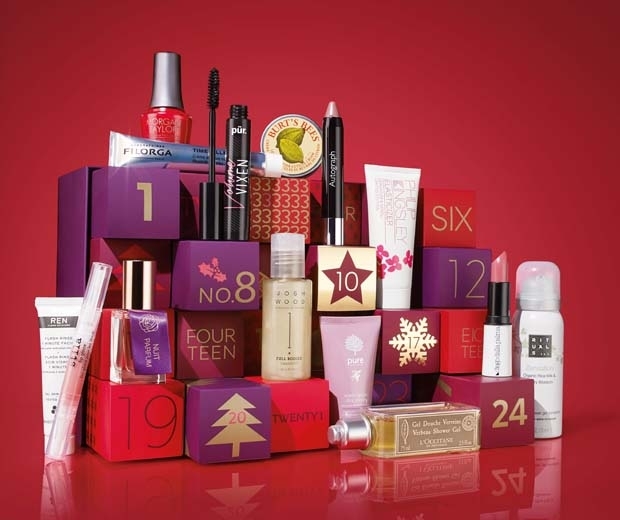 I also seem to have been too late for the House of Fraser advent calendar which did look good though it was all their own brand and as I’ve never used anything from them before I wasn’t sure how good it would be. Last year I ended up with the Tesco one, mainly because I left it way too late for the others, though I’m not sure if they’re doing one this year. If they did one it would definitely be on this list for me as I did love the range of products in there and I have actually ended up using and repurchasing a couple of them which is always a good sign. If Enchanted do one then that would get added to my wish list, they’re always wrapped individually so it’s like opening a Christmas present each day! I had one a couple of years ago but missed out on it last year so I’m keeping an eye out for anything to do with them now. Even though I have said that I’d like a lot of these, to be honest I kind of want them all, I will probably buy two (maybe three) which sees bit excessive but they’re just so fun to open and some of them have so many products that I like or want to try that it’s too tempting not to. Knowing me though I’ll miss the No7 and Marks and Spencer ones and end up buying whatever’s left as those two are being released pretty late so the others might have sold out by then. I think I’ll get one of them and either the Cheeky or the Yankee one. Do you guys get beauty advent calendars? Are there any that you already have that I haven’t listed? I’m sure there are a lot out there and I know of at least ten others that have either already been released or will be released but I didn’t include because you have to stop somewhere and this post is already longer than I meant it to be. Do you guys manage to keep them for each day if you do have them? I am normally pretty good at that with a few exceptions last year when I was writing blog posts ready for when I was away and I had to open them early to get them done scheduled.